The perfect gift for when all the cupcakes have gone. Your lucky friend, partner or family member will have a lovely selection of delicious cupcakes and other gifts and accessories to choose from for another special occasion or just to treat themselves. Perfect for a last minute birthday gift or Christmas present, or just to say thank you or well done. 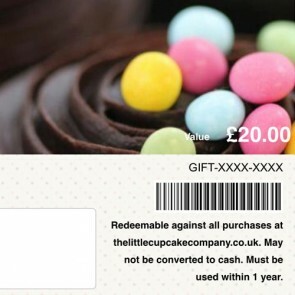 Send by email immediately or choose the date for when you want the recipient to receive the voucher. Choose your image, add your own message and preview the gift voucher you have lovingly chosen and designed. Available in a number of different values and can be used for up to a year. Just the easiest and most thoughtful gift imaginable!